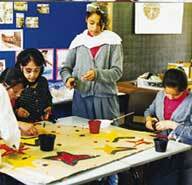 Art workshops allow local people to help design and construct artworks to improve their environment. This can be an end in itself or part of a wider regeneration effort. Community arts projects are particularly useful for helping people express their creativity and develop skills, a sense of identity and community pride. Ideas are generated by local people working closely with community artists and sculptors in studio workshop sessions. People of all ages, backgrounds and abilities can be involved. Architects, landscape designers and other technical experts ensure that the designs are buildable. The community chooses which of the design options generated should be built, usually through some form of voting at an exhibition. 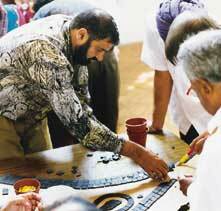 The artworks are manufactured and installed, often with the assistance of local residents. A celebration is held to mark completion. Street lights designed by local residents with community artists. Good way of involving people in development who might not be attracted by more conventional consultation methods. Can break down social barriers and help communities form a common vision. Finding artists willing and able to work with community groups is essential. Providing leadership without dominating is a vital skill. Can be relatively expensive in professional input and project costs. Needs to be seen as a cultural and educational initiative as well as a way of achieving environmental improvements. In this way costs can be partially covered by education or other budgets. Using recycled or scrap materials can reduce costs. "Community arts was a way of communicating more easily and excitingly and to get real ideas from people." School children work with artists in studio workshops developing designs for a pavement mosaic using poster paints, cardboard and scissors. 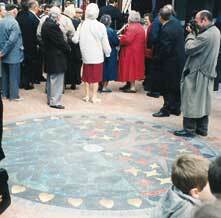 The mosaic is made by local people with no previous experience under the supervision of artists and architects. Local people celebrate an attractive improvement to the street scene which has been designed and made with their help. In contrast to much corporate artworks, such initiatives provide a visible sign of local communities' participation in the environment and can help create places which are successful, safe and respected.